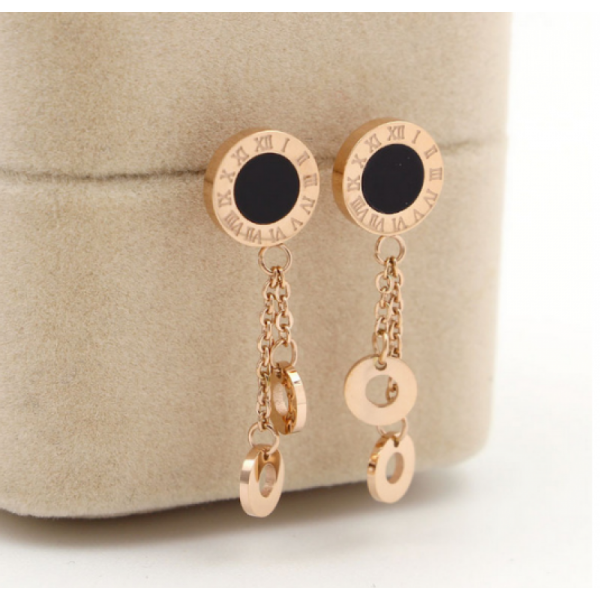 A clock style round ROSE GOLD earrings and roman numbers from One to Twelve embossed all around, circle was filled with deep BLACK color for attraction. Two mini circle shapes having hole in it are hanging connected with same schemed chain. This eye-catching double heart shaped superb zircon hanging style earrings with a beautiful round WH..
GOLDEN with triangle design WHITE stone and BLACK color two pyramids shaped hanging earrings. By we..
Looks like real GOLD, so wondering? This GOLDEN color copper made butterfly with three hanging drop ..
Having push-lock this earring is idiosyncratic by its size and formation. Five hanging schemed pearl..
Vintage style GOLD top bailed multi-teardrop stand dangle suspended vertically alloy made without st.. This beautifully alloy leaves with SILVER polish and schemed pearls is giving distinction to this e..